You can spend a lot of time (and a lot of money) planning and building the ultimate off-road pickup truck — or you can let Fiat-Chrysler build it for you. The Ram 2500 Power Wagon is a turn-key “custom” 4x4 pickup with many popular enhancements that enthusiasts can buy from aftermarket suppliers, and a few they can’t. Is the Power Wagon the all-terrain truck of your dreams? Let’s take it for a drive. “Modded” pickups are all the rage. 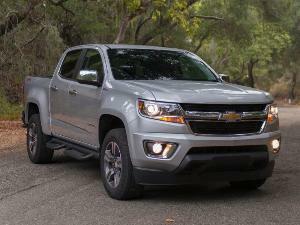 Off-road pickups are big business. Every year, truck enthusiasts spend big money to buy these big burly pickups — and then they spend thousands more to modify and customize them. Suspension lifts, big wheels with knobby tires, winches, and custom grilles — the list of equipment goes on and on. For many buyers, the look of the truck is more important than actual off-road ability; after all, who wants to spend tens of thousands of dollars and hundreds of hours, only to risk smashing all those beautiful parts against a rock? 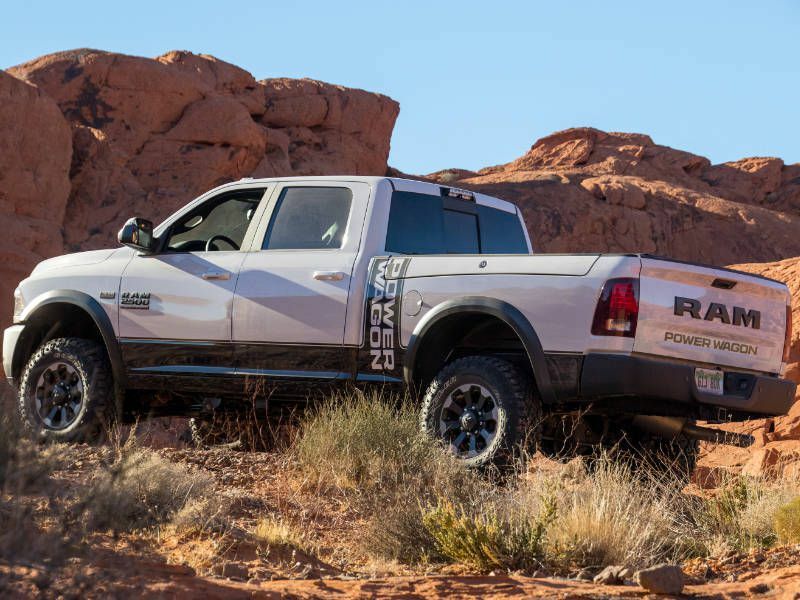 The RAM 2500 Power Wagon represents an alternative route to a custom off-road truck: Everything is bolted on at the factory. This has its advantages and disadvantages. The chief upside is integration. The Power Wagon has some bits that you simply can’t buy from the aftermarket, such as the “Articulink” front suspension, and the integration is perfect. Everything works because it was engineered by the same folks who created the truck in the first place. The chief downside is mass production. The purpose of customization is to make your truck exactly the way you want. If you buy a Power Wagon, at some point you’re likely to pass another one on the street — and chances are it will be just like yours. 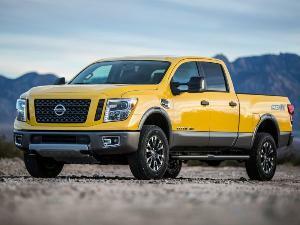 What makes a Power Wagon a Power Wagon? So what makes the Power Wagon a Power Wagon? 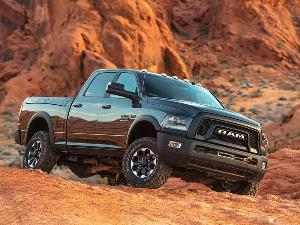 This truck is based on the Ram 2500HD 4x4, and it adds many features to enhance its off-road abilities. 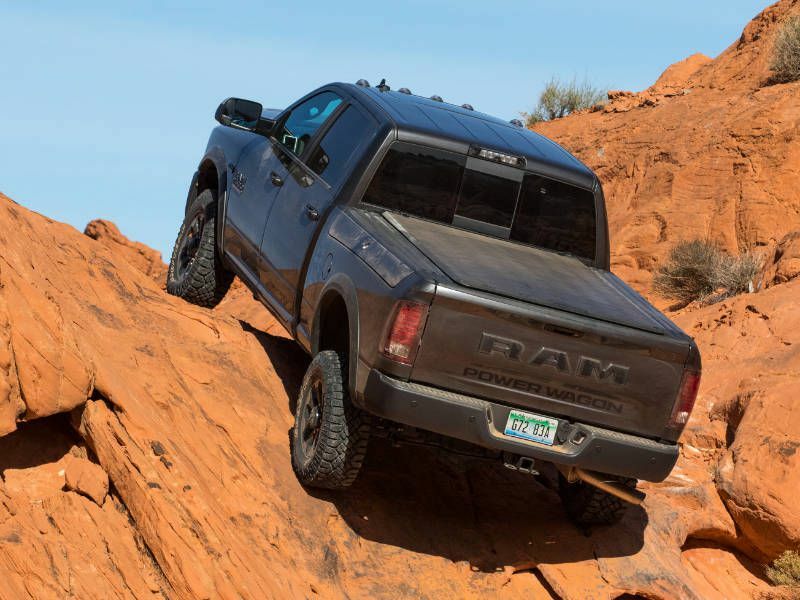 The suspension is a specially modified version of Ram’s three-link design, and it gets a two-inch lift and Bilstein shocks. 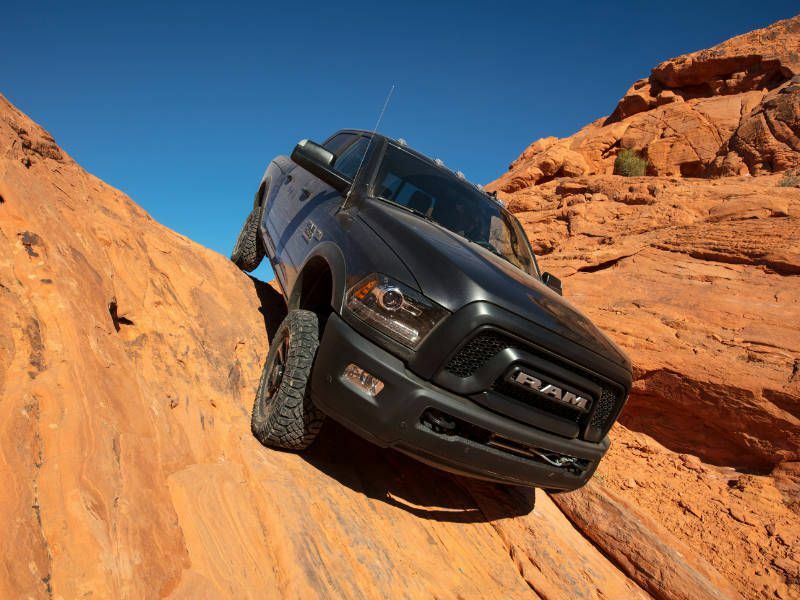 The suspension features Fiat-Chrysler’s “Articulink” design, which provides added axle articulation (the distance the wheels can move up-and-down), and a sway bar that can be disconnected from its axle via a switch on the dash to provide even further articulation. (The sway bar automatically reconnects at 18 MPH.) The 17-inch wheels wear 33-inch Goodyear Wrangler Duratrac tires, designed for better off-road traction. Winches and diffs, and what’s in a name? The Power Wagon comes with a Warn 12,000-lb winch mounted on the front bumper, as well as front and rear differentials that can be locked electronically. Locking the diffs forces both wheels on one axle to spin at the same speed, allowing the truck to get traction when one of the wheels is on a slippery surface. With both diffs and the transfer case locked, only one wheel needs a good gripping surface to get the truck moving. The Power Wagon also gets its own styling cues, including a unique grille (inspired by the RAM 1500 Rebel), unique interior trim, and Power Wagon badging. And in case you’re wondering about the Power Wagon moniker: It’s named after a four-wheel-drive utility truck that Dodge started selling in the mid-1940s. 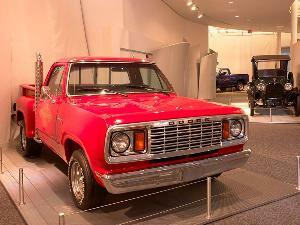 The original Power Wagon was so austere as to be agricultural, but it was a tireless workhorse. Driving an off-road pickup on the road. The idea of a tough-as-nails off-roader sounds good — but what is this beast like to drive on the streets? No question, it has its drawbacks. 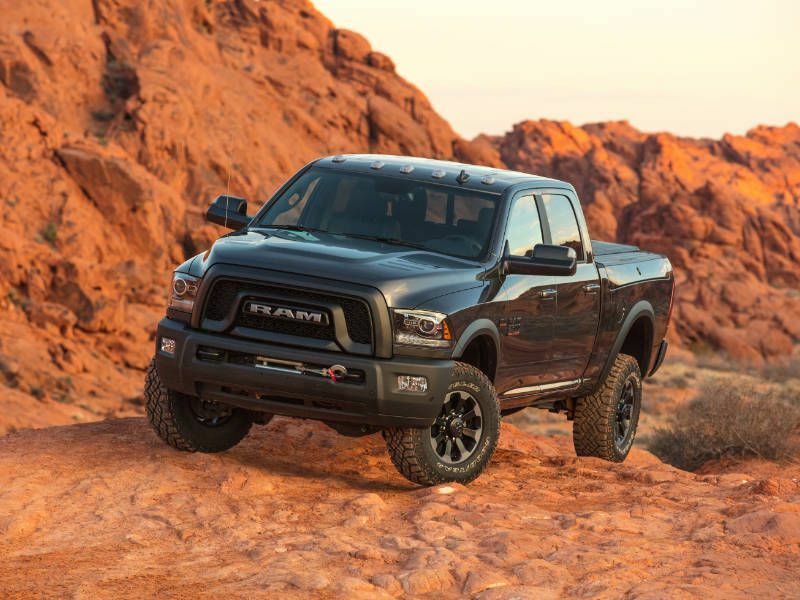 In order to maximize its ground clearance, Ram doesn’t fit running boards or side steps, and it’s a long climb up to the cab. It’s also a long way down: Over the course of our week-long test drive, all three members of my family stumbled out of the truck at least once. We kept asking each other: “How many times did you fall out of the Power Wagon today?” We had a good laugh about it, but the ability to get in and out of the truck (as well as your partner, your kids, your parents, and grandparents, etc.) is something to factor into your purchase decision. It works like a proper truck. What we like about the Power Wagon is that it the off-road hardware hasn’t affected its basic work ethic. 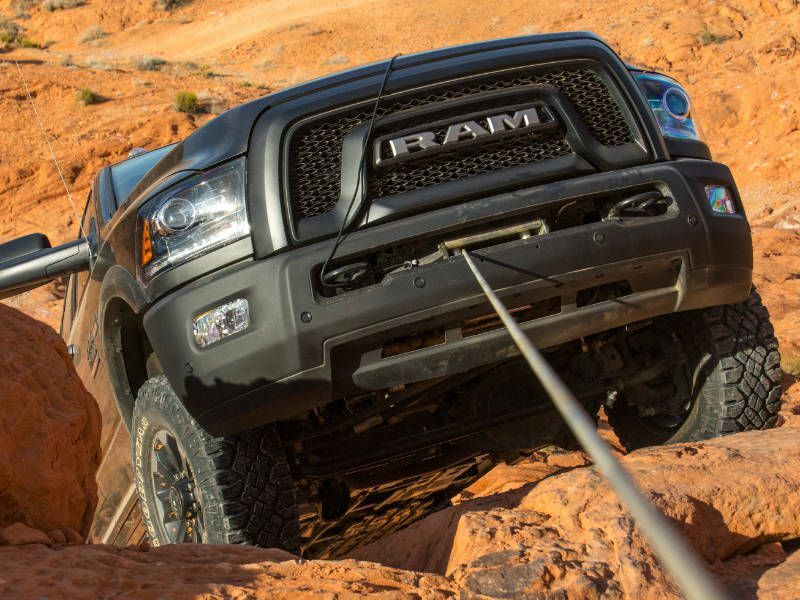 Softening the suspension for off-roading often impacts towing and hauling abilities, but the Power Wagon maintains a 1,500-lb payload and 10,030-lb towing capacity. That’s less than some variants of the RAM 2500 — properly equipped, the 2500 can tow nearly 18,000 lbs and carry over 3,000 lbs — but it’s enough to be useful. We hooked our horse trailer to the Power Wagon (with the horse on board, it weighs just shy of 5,000 lbs), and the truck towed it beautifully, with the stability we expect from a three-quarter-ton truck (and a more comfortable ride to boot). Speaking of ride quality, that’s another aspect we really like about the RAM 2500 (not just the Power Wagon, but all variants). While most heavy-duty pickups use leaf springs in the rear, Ram uses coil springs and a five-link setup to locate the rear axle. 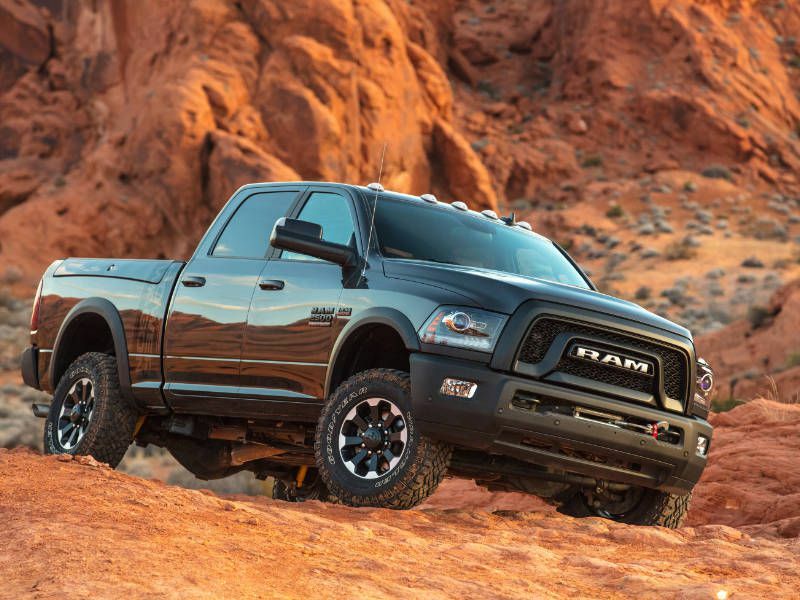 This is a significant advantage over the competition: While the ride is still rougher than you’d find in a 1500-class truck, the Ram is noticeably more comfortable than the Chevrolet Silverado 2500 and significantly smoother than Ford’s new F-250. We also expected the Power Wagon’s big tires to have a negative effect on drive quality, but the truck (and its tires) surprised us: The Power Wagon’s steering accuracy is better than we expected, and while noise levels are somewhat higher than regular street tires, the Goodyears are surprisingly quiet considering their aggressive off-road tread. Ram offers a Cummins turbodiesel engine as an option on other RAM 2500 variants; unfortunately, it isn’t available on the Power Wagon. Why not? 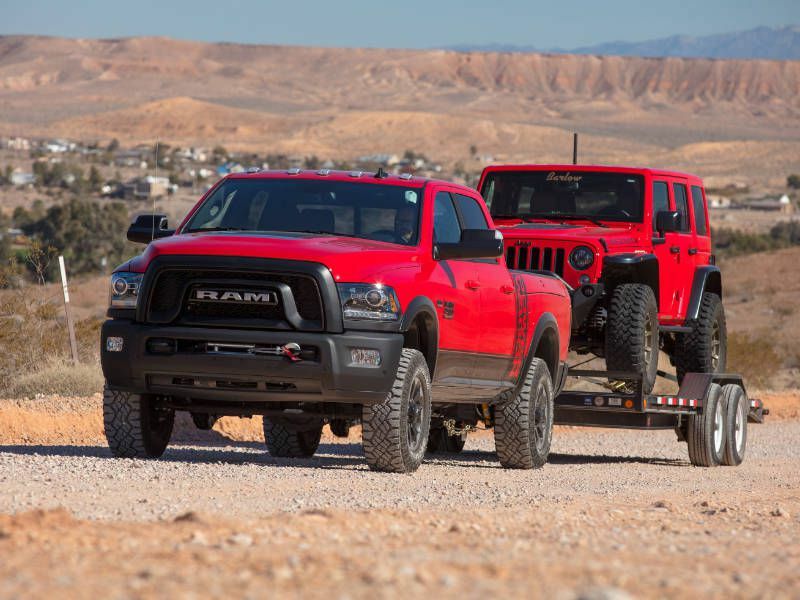 Dodge says that the larger size of the straight-six engine wouldn’t provide space for the winch, and it would also increase the cost of the truck. 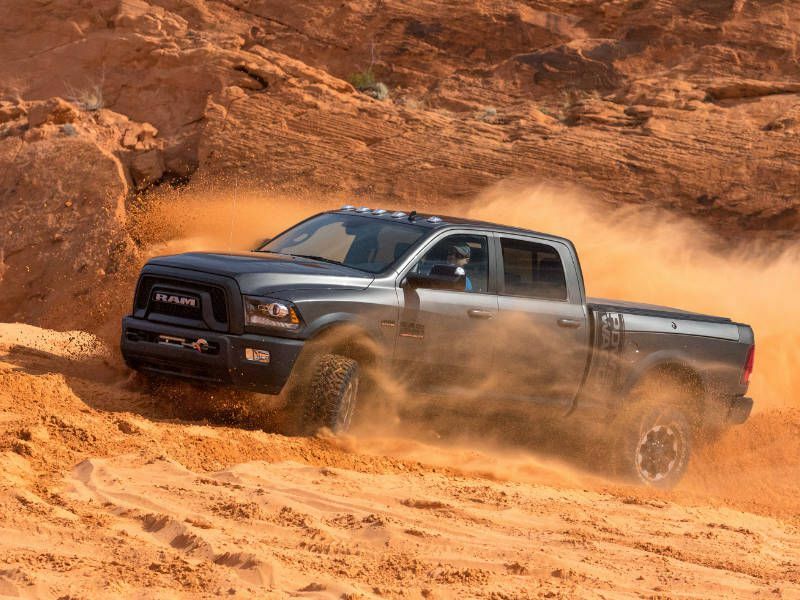 We can’t argue with the latter point — the diesel is a $9,000 option on other Ram 2500 models — but considering that many heavy-duty diesel trucks now sell for well over $75,000, we’re sure there are buyers who would pay it. The low-end torque of the diesel is an advantage for low-speed rock crawling, and we’re sure there are buyers who would be willing to do without the winch in order to have access to the fantastic Cummins diesel. Dodge sells the Power Wagon in three models: The basic Tradesman, priced at $47,755 (including destination fee), provides the Power Wagon’s raw abilities (including the winch!) in a no-frills model. It’s a great choice for businesses that need a truck with the Power Wagon’s capabilities, and it also makes a nice blank canvas for those who dream of customizing. The regular Power Wagon lists for $52,355, and for those who want to rock-crawl in comfort, there’s a Laramie model that lists for $58,875. 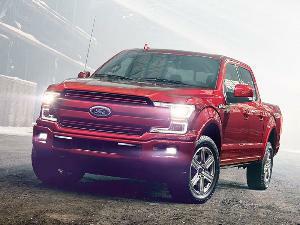 Most special-edition trucks of this sort come in a single model and at a single (usually very high) price, so it’s a pleasant surprise to see the Power Wagon offered in three different versions to suit different budgets and needs. 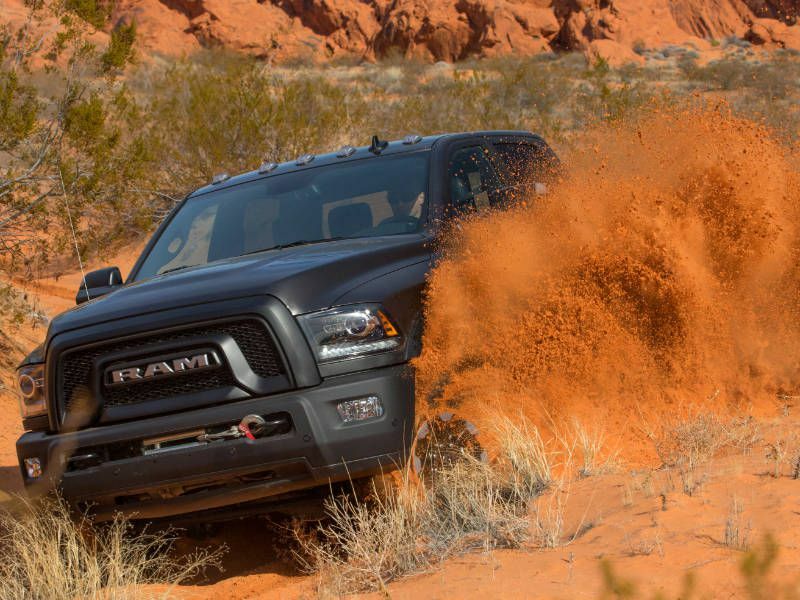 Should you buy a Power Wagon? 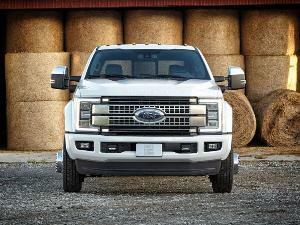 There’s certainly a lot to like about this big, burly pickup. The RAM 2500’s coil-sprung suspension makes it more pleasant to live with than other heavy-duty pickup trucks. And even if you are the type who likes to customize, there’s plenty of aftermarket equipment you can add to increase the Power Wagon’s abilities even further. That said, a truck this size has its drawbacks: It’s difficult to park and drinks gas like the stuff was free. And if you are serious about off-roading, size does matter: A small, short-wheelbase vehicle like a Jeep Wrangler generally does better off-road than a big pickup truck. The Ram 2500’s long wheelbase limits the size of the objects it can drive over, and its massive size means there are some spaces though which it simply won’t fit. 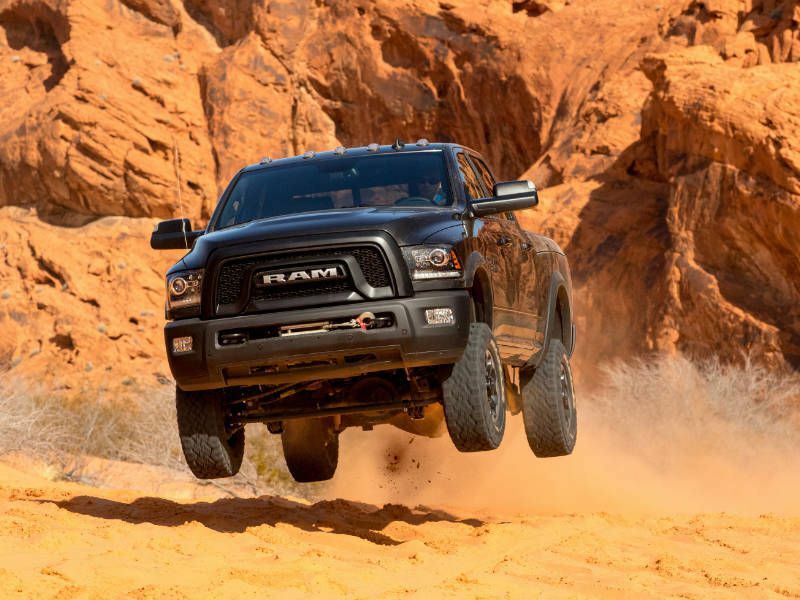 Still, if you’re looking for a good-looking truck with serious off-road abilities, the Ram 2500 Power Wagon is the real deal, a HEMI-powered drone that will scream down the boulevard. We recommend giving it a last chance power drive (with a nod to Bruce Springsteen).